San Jose Veterinarians Announce San Jose Vet Sponsored Toy Drive. This holiday toy drive sponsored by the San Jose vets at Camden Pet Hospital of San Jose will benefit kids in need. Helping families with San Jose veterinary service. San Jose Veterinarians at Camden Pet Hospital of San Jose are announcing a holiday toy drive ending 12/20/2011 to benefit less fortunate children this holiday season. It is their way of being more involved in the San Jose community this winter. “Our San Jose Vet business has been helping families with San Jose veterinary service for over 30 years, they are also Los Gatos Veterinarians. This year we wanted to do a little bit more to help the local San Jose community and we thought a holiday toy drive would be a good way to do it,” says Dr. Hoge, Owner of Camden Pet Hospital. According to Dr. Hoge Camden Pet Hospital will deliver the toys to a local charity for distribution on 12/21/2011. “I hold a special place in my heart for these San Jose kids, I hope we can make a difference for some kids and make their holiday special,” says Dr. Hoge. 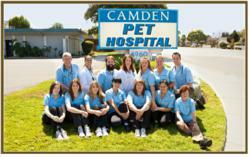 Camden Pet Hospital has been providing San Jose Veterinarians and San Jose vets for over 20 years. During that time Dr. Hoge has provided many charitable donations to various charities. He feels that by doing the holiday toy drive himself he will be able to play a more active role in helping others. “Collecting the toys and getting them distributed to kids in San Jose who need them will feel great. We should all do a little more to help each other. That is what a community is about,” says Dr. Hoge. To help reward San Jose vet customers who give an unwrapped toy, Camden Pet Hospital of San Jose is offering a 10% San Jose veterinary discount off of vet services through 2012 including San Jose vet service, San Jose veterinary care & immunizations. San Jose Veterinarians at Camden Pet Hospital will end their toy drive on 12/20/2011. Any person who wants to donate a new unwrapped toy to the holiday toy drive can do so by delivering the toy to Camden Pet Hospital’s San Jose location at 4960 Camden Avenue San Jose, CA 95124, (408) 265-2200. For directions or more information about the San Jose Veterinary coupons available to people who donate a new unwrapped toy, please call Camden Pet Hospital directly at (408) 265-2200. These San Jose Veterinarians are offering 10% off of any veterinary service including immunizations and pet surgeries. The coupon can be used once per customer. Camden Pet Hospital of San Jose is doing their part to help those in need this holiday season. They will be collecting toys until December 20, 2011 at their San Jose location. All toys donated will be distributed to a responsible charity to be distributed to children in need. For more information about the San Jose Veterinarians at Camden Pet Hospital please visit their website or give them a call at (408) 265-2200.